The cuckoo watches her victim closely. Her egg -- like a bomb -- must be perfectly timed. Too late, and it will not hatch in time -- too soon, and it will be discovered. The host -- a Reed Warbler -- is vigilant, and ready to abandon her nest or eject suspicious eggs at the slightest suspicion. 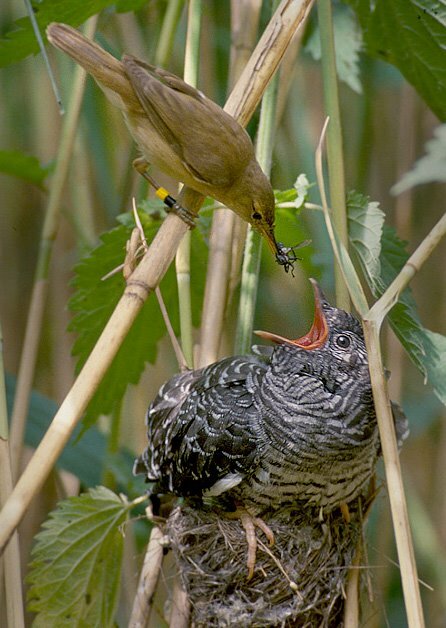 When the nest is unattended one afternoon, the cuckoo flies down and lays an egg within seconds, and then escapes stealing a host egg in her mouth. A minute later the warbler returns and closely inspects the nest -- but notices nothing amiss. The cuckoo egg closely resembles the host eggs. But when it hatches, the cuckoo chick will use a specialized beak to kill or eject its nest mates, and then grow to grotesque size -- while the unknowing parents raise a monster in their clutch. Bird watchers have long been puzzled by the fact that Cuckoo eggs closely mimic the host eggs -- even though the same species may parasitize several kinds of nests. How could the Cuckoo vary its egg to fit the intended victim? This puzzle has a fascinating answer. The female Cuckoos are broken up into specialist types -- called "gentes" -- each preferring a specific host species and producing a differently camouflaged egg that will not be rejected. However, gentes are not separate species because the different gentes interbreed freely among the same males. The riddle of the different egg types is solved when we recognize the genes encoding the mimetic eggs are encoded by mitochondrial DNA -- passed down only in females, and not are subject to sexual selection. Interestingly, because Cuckoos don't raise their own offspring, the birds are never taught their devious behavior -- the cheating is entirely the result of instinct. However, it seems likely that the Cuckoo chicks learn to target their specific host species by "imprinting" during early life. Perhaps the Cuckoo mother's motives are less sinister than they seem -- from the Cuckoo's point of view, she is simply trying to provide her chick with the same kind of adopted parents that she once knew!